Good evening everyone! Sorry I’ve been a little MIA recently, I’ve been filming and sharing some new YouTube tutorials. You can watch them here… please feel free to subscribe to my channel while you’re there! 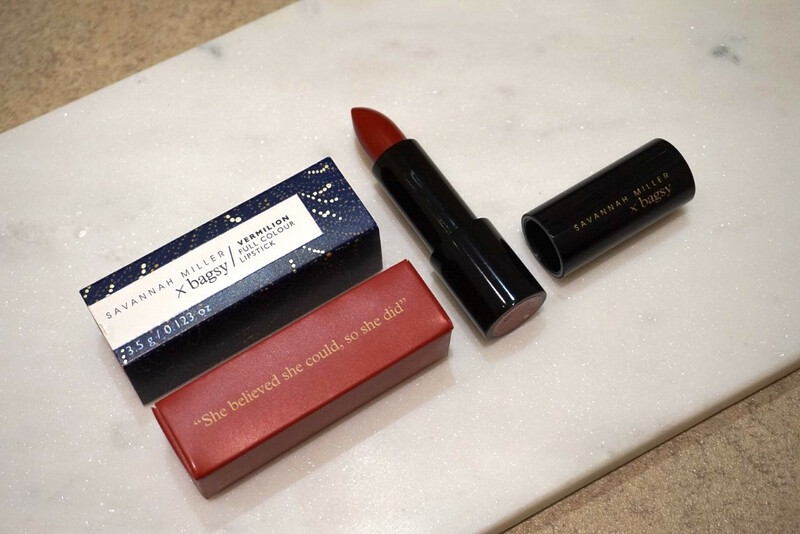 Anyway, today I’m going to be talking about a new lip product that I was recently given – the Savannah Miller x bagsy Vermillion Lipstick. I’m normally not the world’s biggest fan of ‘traditional’ lipsticks, especially not intense red ones, so my usual choice would be a highly nourishing matte lipstick. However, I was feeling brave and knew that I had to test this products theory – could it really suit every skin-tone? Produced by British-born, cruelty-free makeup brand – bagsy beauty, this red lipstick really did surpass all expectations… and while it’s £16 price-tag is a fraction steeper than I would have hoped for, considering how fresh the brand is to our eyes, I would heavily recommend investing. I can’t speak for every skin colour, but I’m certainly happy with the combination of blue and red tones which flatter my porcelain skin, WITHOUT draining all the (minimal amount of) colour from my complexion! Besides the gorgeous colour, this lipstick is also fairly long-lasting (it was a good few hours before I had to reapply a layer) and most importantly… nourishing. It didn’t leave too much residue on cups when I drank and it didn’t even really require a lip liner (although of course, I opted to add this), so I’m really quite impressed. I’m not quite a traditional lipstick convert, but certainly a more open-minded individual when it comes to shopping for lipsticks in the modern world! Gone are the days of unflattering lipsticks which seep outside of your natural lipline and create a fuzzy effect, although apparently, that’s what the runway is predicting to be the next big trend… I think I’ll give that on a miss! Did you enjoy what you read today? Please follow my blog and leave your comments in the space below!